Durian lovers rejoice! Get ready to savour a free-flow of the irresistible D24 Durian McFlurry at all McDonald’s restaurants in Malaysia. 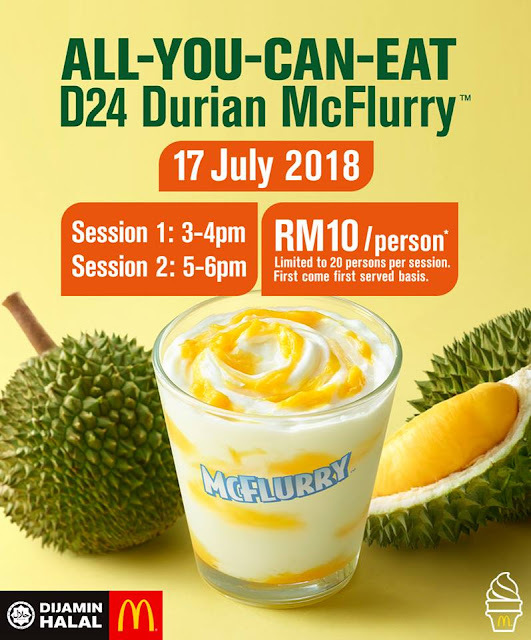 On Tuesday, 17 July all McDonald’s restaurants in Malaysia will be setting aside two one-hour sessions dedicated to enjoying a well-known take on the king of fruits! The D24 Durian McFlurry is one of McDonald’s hottest-selling menu items. Made with vanilla soft serve mixed with real D24 durian, it is the perfect and ultimate treat for all durian fans. For more information, visit McDonald’s Facebook page or website at https://www.mcdonalds.com.my. Follow the Durian McFlurry craze on social media with the hashtag #DurianMcFlurry.